Compared to other places, the shrine grounds felt as if far more spirits were hanging around. In fact, it almost seemed like they wanted to claim the souls of the people living there. Kuroji and Saragimaru had business with those people. Tsubakura: "Okay, so, explain this one more time?" Kuroji: "I assume that your asking again means your answer is 'no'?" Yabusame "Hey, hey. What are Salami-kun and Kuroji-san doing together, anyway?" Kuroji "That topic's unrelated. There's no need for you to know, Yabusame-kun." Tsubakura: "'Kay, so why do we have to take that weird brat off your hands?" Shion: "Because you smell really, really good~!" Yabusame: "Tsuba smells very good, don't they~?" Saragimaru: "Apparently, they followed the smell aaall the way here. Do you stink that bad?" Tsubakura: "Eugh. Don't talk about people like they're raw trash." Kuroji: "Well, it's probably because they're a similar type to Yabusame-kun. Which puts them under your jurisdiction, yes?" Tsubakura: "Arguing against that would probably be pointless, so I won't try." 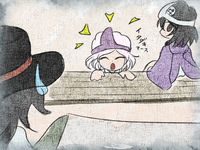 Yabusame: "Seems like we made a new friend, Tsuba~. 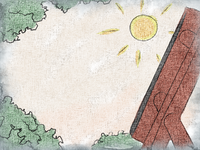 ♪"
Saragimaru: "Well, looks like the kid wants to stay here too. We're countin' on you, Priest." Tsubakura: "Why do we have to go an' adopt some weird thing-we-don't-even-know-what-it-is?" 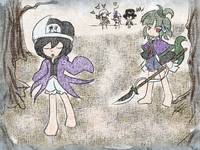 Kuroji: "It's an aggregate of wills born from the Harujion, a living ghost, a chimera soul..."
Yabusame: "Uhh, guys, Kuroji-san started reciting black magic?!" Shion: "Aw, c'mon. It's not that hard, is it?" Tsubakura: "...Okay, so, that's what the kid is?" Kuroji: "My work here is done. Now, if you'll excuse me." Saragimaru: "Okay, so where do you plan to drag me off to after this?" Kuroji: "We'll gather more spirits and hawk them off on those ritual-havers. There still ought to be some floating around." Yabusame: "Ahaha~, you're up to just as much shady stuff as usual!" Saragimaru: "...As a fellow victim of yours, I'd rather try to go an' make friends with them." Kuroji: "Do as you wish. I'll grant you at least that much authority." Tsubakura: "...Why are they always acting so high and mighty...?" Shion: "They smell re~ally bad!" 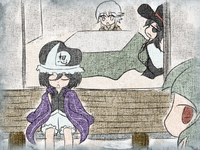 Yabusame: "Looks like Kuroji-san is still the same as ever~." Once again, Kuroji's actions had resulted in many, many victims. it seemed they had adapted quite well to this new world. To Kuroji, everything in the world is a give-and-take. Thus would their victims continue to increase. ———So Saragimaru thought, while glowering in Kuroji's direction. have been creating a pretext with which to kill time. This page was last edited on 13 August 2018, at 00:25.